Hils and Neil arrived to find that the yurt was cold and leccyless! No heat? No problem! We got the wood burner roaring before the rest of the group arrived. No light? No problem! We got the candles burning. So Yurt as cosy and light as we could manage we checked in after a fortnight’s break. A lot had happened since we last met. There was sadness, grief and health issues we were able to share with each other as well as personal progress and plans for the future. There is a sense of ‘family’ and we talked about the good times, the support and what we got from the group. We also talked about our anxiety sadness and hope about the coming changes when the Yurt moves to it’s new home. We had to make tea in the main building which meant a soggy walk as it was pelting with rain. However, with hot tea in hand we discussed what we would do with the rest of the day with no electricity. It was decided that we would go to a dog friendly pub for lunch as our canine group member Duke had joined us today. We checked out before leaving for the pub. 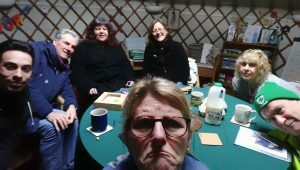 The group feeling was that although it had been a shorter, colder, 100 per cent candle lit day, it felt satisfying as we had met together in our Yurt had been able to share what we had experienced since we last met and had received support. Another happening! We got to the pub to discover it wasn’t serving lunch, not to worry, we all agreed that we were happy to end the day there and look forward to seeing each other next week.